What seems so easy to forget is that three years ago the Avalanche were coming off a dreadful season – going 16-25-7 in a lockout-shortened 2013 schedule and finishing ahead of only the Florida Panthers in the 30-team overall standings – when the club put together one of the most stunning turnarounds in NHL history. In Joe Sakic’s first season as the top hockey executive and Patrick Roy’s debut as head coach in 2013-14, Colorado jumped all the way to third overall and won the Central Division with 112 points before collapsing against Minnesota in the first round of the playoffs. Perhaps the reason that the turnaround in Sakic’s first year at the helm is so easily forgotten is that a similar turnaround for the Avalanche in 2017-18 seems unimaginable. This time around, the baseline is far lower, the task glaringly more daunting. It will be a quantum leap to just become decent. Yet, that is the task for Sakic and everyone below him in the hockey operation. The Avalanche weren’t just bad last season with NHL coaching rookie Jared Bednar behind the bench after Roy’s shocking August resignation. Colorado’s season was a 22-56-4, 48-point nightmare that was the NHL’s worst single-season performance since the expansion Atlanta Thrashers posted only 39 points in 1999-2000. If you care to go back farther in local hockey history, the legendarily awful Colorado Rockies’ worst season in their six seasons in Denver was a 15-53-12 record for 42 points. At least the 2016-17 Avs beat that, right? Well, here’s the catch: There was no overtime then and if you charitably assume the Rockies would have earned a second point in six of those 12 ties, that would have pushed them to 48. Plus, the Rockies were the Rockies, who had some decent (or better) players but were always woebegone in their six seasons in Denver. Through three ownerships, instability, rumors of moving and a carnival atmosphere that at times seemed to outdo “Slap Shot,” you expected ineptitude from the Rockies. 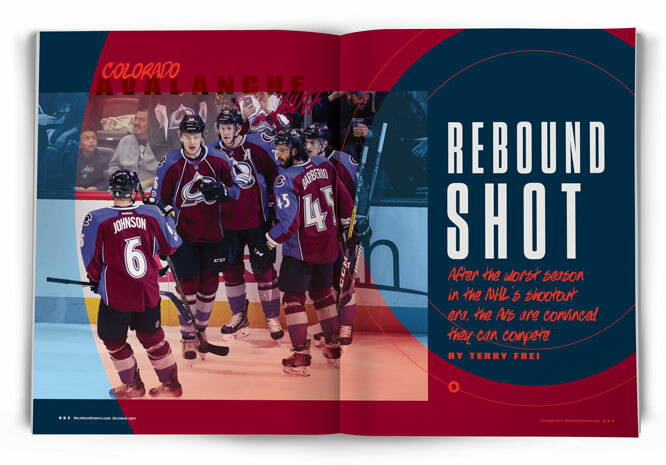 But this is the Avalanche – the team that won the Stanley Cup twice in its first six seasons in Denver, had a nearly 11-year sellout streak, had one star after another stepping off the bus at road games and was instrumental in helping make Colorado one of the nation’s youth hockey hotbeds. This wasn’t supposed to happen to the Avalanche. Whatever could go wrong for the Avalanche last season did, with Colorado’s drafting failures, most notably involving its inability to claim and nurture young defensemen in recent years, coming home to roost. On the way to missing the playoffs for the third consecutive season, and for the sixth time in the past seven seasons, the Avalanche pulled off the ignominious double of scoring the fewest and allowing the most goals in the league, while also having inept special teams, finishing last on the power play and 29th in penalty kill. And the Avalanche managed it while scraping the NHL’s salary cap ceiling, meaning it was impossible to attribute the failures to ownership’s lack of financial commitment. The 2016-17 Avalanche’s spot in history should be as the worst bang-for-the-buck season in NHL history. “Yes, we had a terrible year – up and down, it was not a good year,” Sakic conceded, then adding that the 20-goal rookie season from winger Mikko Rantanen might have been the single exception. “But our top guys did not have good years, production-wise,” Sakic added. “And our goaltending situation, with [Semyon Varlamov] being out, and we might as well say the whole year with his issues, that snowballed. Indeed, the Avalanche’s six-man “core” – Varlamov in the net, defensemen Erik Johnson and Tyson Barrie, and forwards Gabriel Landeskog, Matt Duchene and Nathan MacKinnon – were injury-plagued or unproductive and inefficient… or both… or all of the above. Signing all to contract extensions and tying them up for the near future was at the core of the Sakic strategy, and they didn’t live up to that faith. Coincidentally, the “core” six are the only players remaining from the 112-point team in 2013-14. Landeskog, the Swedish winger who still is only 24, will enter his sixth season as the Avalanche captain when Colorado opens at Madison Square Garden against the New York Rangers on Oct. 5. As the losses mounted last season, it was his task to be the primary spokesman in the dressing room, searching for explanations, often peering off in the distance as he reacted thoughtfully – in his second language. The good news is it can’t get any worse. Down the stretch of the season, Sakic openly talked of the impending overhaul, of paring veteran salaries (and bodies) and getting younger and faster in a league annually putting more of a premium on both. Colorado had painted itself into a corner with some veteran contracts; most notably, signing defenseman Francois Beauchemin and winger Jarome Iginla to deals that initially seemed reasonable but ultimately took them beyond their windows of effectiveness. Iginla was traded to Los Angeles late last season and Beauchemin was bought out in the offseason, providing no salary cap relief but opening up a roster spot and committing the Avalanche to getting younger on defense. The first wave of changes came in the final days of the season, with Tyson Jost – the 2016 first-round draft choice – signing and joining the Avalanche after his freshman season at North Dakota, and fellow forwards J.T. Compher, Sven Andrighetto, and Matt Nieto, and defensemen Anton Lindholm and Mark Barberio all landing on the Avalanche roster via waiver pickups, trade and call-ups. In the offseason, the Avalanche were unable to sign 2013 draft choice Will Butcher, the Hobey Baker Award winner last season at DU (he became a free agent and signed with New Jersey), but countered that by signing two other previously drafted players in Butcher’s situation – centers Alexander Kerfoot of Harvard and Dominic Toninato of Minnesota-Duluth. Both were drafted in 2012, Kerfoot by New Jersey and Doninato by Toronto, and like Butcher became free agents on Aug. 15. It took some recruiting for the Avalanche to land them both, given the little flexibility in entry level contracts, so it seemed reasonable to assume that both had been assured that the Avalanche would have openings at forward – even if that meant trading Duchene. Colorado also acquired forward Colin Wilson from Nashville and signed former NHL No. 1 overall pick Nail Yakupov – a washout at Edmonton and then all but invisible at St. Louis last season – to a one-year deal. Earlier, though Colorado was the league’s worst team by far last season, the Avalanche emerged from the weighted draft lottery with the fourth overall pick, the worst possible outcome. They took defenseman Cale Makar, who will play at least one season at UMass before signing with Colorado. So, there won’t be immediate help there. To some, it is a bit of a surprise that Bednar will be back behind the bench to work with the retooled roster. In a sport that treats coaches with all the respect of disposable razors, it cut against the grain when Sakic was adamant that Bednar wouldn’t lose his job after the 2016-17 fiasco. Citing the timing of Bednar’s hire and the circumstances, Sakic stuck with the rookie head coach – who will have more of a chance to place his imprint and impose his approach this season. Last season was Bednar’s first in the NHL – in any role. Prior to that, he was a minor-league defenseman, and then an assistant and head coach in the ECHL and AHL. When Roy departed, citing his diminishing input in player-personnel decisions despite a vice president’s title in front of his name on the organizational hierarchy, Bednar moved up from the Lake Erie/Cleveland Monsters of the AHL, where he had just been part of a Calder Cup championship. He walked right into a mess. Now the question is whether he can be part of the solution, or a casualty. “I learned a lot last year,” he said. “Some of it is just how unforgiving the league is. You come to training camp every year and are precise with what’s going on. We liked our camp last year. We liked it a lot. We liked what our players did through camp and exhibition and into the season. Our resolve to fight through some things past that, I think we can get much better at and that starts with me, that our details stay tight and we don’t get loose. It’s up to the players too to push each other to make sure they respond every day. Varlamov was spotty in goal when he played and also continued to be plagued by the groin muscle issues that have been an off-and-on problem at least since he broke in with Washington. Ultimately, the Avalanche shut him down. He underwent hip surgery twice – trust us, there’s a hip-groin connection there – and now all hope the health issues are behind him. His backup, Calvin Pickard, departed to Vegas in the expansion draft, and Jonathan Bernier – signed as a free agent after playing for Anaheim last season – is an upgrade who could be a decent or better No. 1 if need be. “You put it in the toilet,” Varlamov said. “It’s history. Nobody wants to talk about it anymore. We all know it was a frustrating year. We learned from that. Bad things, good things. Johnson missed nearly half the season with a broken leg. At 29, he still has time to live up to the expectations created when St. Louis made him the NHL’s No. 1 overall choice in 2006. Yet even if he falls short of that, Johnson clearly is this team’s best defenseman. Johnson noted that last season “was painful for us and the fans to go through. You have to fail before you can win, and we’ve failed for quite a few years now. It’s time to start writing our legacy for this group of guys. It’s my team now. It’s Gabe’s team. It’s Nate’s team. It’s Tyson’s team. It’s Varly’s team. We’re the older guys that decide what happens on and off the ice, and it’s our job to make sure everyone pulls with us. Although he has shown flashes – especially tantalizing when they’re displayed in international play, including the World Cup for Team North America and for Canada in the World Championships – MacKinnon remains an underachiever, given he was the No. 1 overall pick in 2013. To be fair, he never was touted as the “generational” No. 1, as was his close friend and fellow Nova Scotia native, Pittsburgh’s Sidney Crosby, and Edmonton’s McDavid, and Toronto’s Auston Matthews since. But MacKinnon’s 16-goal contribution last season was a thunderous disappointment, as was his lack of improvement after he won the Calder Trophy as the NHL’s rookie of the year in 2014. As the Avalanche get younger and faster, that should aid MacKinnon, now a graybeard at 22. Going into this season, the Avalanche’s oldest player is center Carl Soderberg, now 32 and another veteran who hit a wall last season and still is around only because he is under contract through 2019-20. Another key for the Avalanche would be for Barrie to rebound from a horrible season, his first after signing a new four-year, $22 million deal after going through the NHL’s only salary arbitration hearing in the 2016 offseason. He had only seven goals, and Colorado needs more from the offensive-oriented defenseman. Continuing to struggle in the defensive end, Barrie also tied Duchene for the worst plus-minus in the league at minus-34. It’s not impossible, but the numbers are intimidating. It took 94 points to make the postseason in 2016-17. The Avalanche not only have to improve, they need to roughly double their point total to be assured of making the postseason. A more realistic goal is to demonstrate that the retooling has this franchise moving in the right direction… again. It has happened once before with Sakic at the helm. If it doesn’t happen again, Sakic – a franchise icon – might stay, but in a different role as titles are massaged and another hockey executive comes in to run the hockey operation.